The time has come to move Gracie's updates to our family blog. I haven't been all that great at keeping this one updated. Life with two has slightly rocked my world this last year, especially in combination with our third adoption journey long underway. But I wouldn't trade it for anything. Gracie is the sweetest, most lovable baby on earth. I adore her. Gracie is currently 18 months and the newest post on our family blog gives a detailed update on her new achievements and adventures. Click on over to: http://www.thispoeticpresent.blogspot.com and become a follower as we share our family adventures and our newest adoption journey to bring Keemberlie (age 6) home from Haiti. Thank you for all the support during our Ethiopian adoption and first year at home! 15. Fire Protection Checklist - completed by county/city fire dept. 16. Environmental Health Checklist - completed by county/city health dept. 31. All 4 home study visits are done and home study is approved and notarized! Each of the following items must be obtained, notarized, state certified, then sent to US State Department, then on to the Ethiopian Embassy. Words in pink= completed. 18. 2 passport photos of Billy and Cindy: obtain, no notarization or other steps required. 36. Haven't even come close to listing all the over night shipments, baby items, packing items, international travel items, etc purchased along the way. 35. In-Country travel package for stay in ET: estimated to be $1400 for 3. 32. IS PROBABLY LEAVING SOMETHING OUT BECAUSE IT'S BEEN TOO LONG SINCE SHE'S UPDATED THIS LIST! 4. AWAA initial program fee (1/18/08): $1,000.00 (since this is our 2nd. 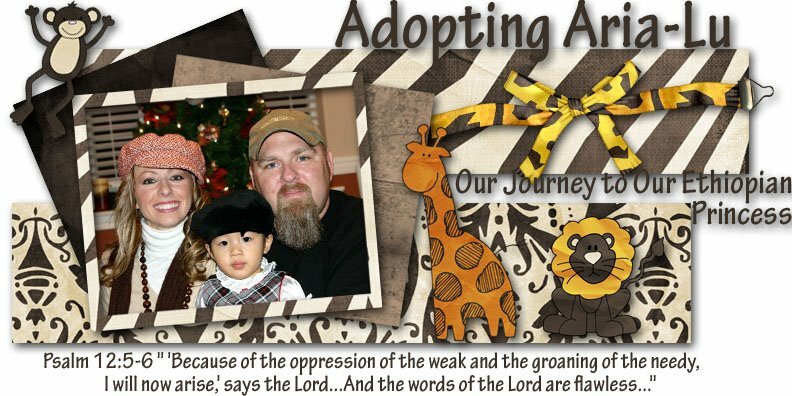 adoption with AWAA this first payment was $500.00 less than normal and our third program fee will also be $500 off). May 19, 2009 - hoping to receive call in the morning saying we can leave tomorrow afternoon for ET. Waiting on daughter's birth certificate in ET to be completed!!!! Praying all night! May 13, 2009 - PASSED COURT! Tseganesh became Aria Lu Grace Foote with a new hope and inheritance in more ways than one! April 14, 2009 - REFERRAL for 3 month, 5.6 pound baby girl! Nov.9 - 15 - experienced lots of stress and anxiety this week and remembered that the last time I felt like this was in Nov and Dec of 2005. Libby was born that Nov. 23, 2005 (which I was not aware of at the time) and now I wonder if Aria-Lu will be born this week/month....hmmmm....praying! November 13 - 5 months officially waiting!!! October - submitted papers for home study addendum (address change for new house - new environmental health inspection, new fire inspection, new photos and copy of HUD showing ownership of new home - all required - plus future home visit by social worker). June 13 - all docs completed. Dossier is shipped to ET -This is our official DTE date! June 5 - Log in Date - Dossier arrived in VA office. June 4 - Finished State Certifications in Austin and Mailed Dossier to AWAA!!!! June 3 - after much frustration regarding fingerprints and re-fingerprints - 171-H arrived today! April 15 - Got fingerprints done today!! March 31 - home study reports arrived at our house at 8am - by 9am one copy was in the mail to USCIS! By March5 - finished all 4 home study visits. Received TX certified docs back.One had a minor error. Contacted CPA to re-notarize Billy's employment verification letter. Have already received corrected doc back. Waiting to State Certify it until I have last reference letter, homestudy and 171-H.
Feb. 22 - UPS mailed most of our docs to Austin for State Cert. today. Feb. 19 - Billy's birth certificate arrived with the glorious gold seal. It's State Certified! The VA doc has also returned State Certified! AND our notarized proof of life insurance arrived today as well!!! Also - I mailed off my birth cert and our marriage cert to SC for State certification. Only TX State certifications left to do once all docs are collected!! Woohoo!! Feb. 16 - sent Billy's birth cert. off for KY State Certification. Sent a doc. to VA for State Certification. Notarized ammended Application to Ethiopia. Faxed ammended doc and 2 references letters to Duni. Marriage License arrived!!! By Feb. 15 - 2 notarized references received for dossier, today Sarah (social worker) called and set first home study visit for Feb. 28th. at 2pm, faxed docs were approved, gathering info for state certifications - will ship KY doc for state cert. tomorrow. Aria's room mostly finished (except pics/mirror/some decor). Requested letter from life insurance co. for notarized letter (proof of life ins. requirement for dossier paperwork). Feb. 11 - pick up notarized medical forms, fire inspection at 11AM, UPS completed home study packet to AWA-TX! Faxed more docs to Duni (family coordinator) for approval. Feb. 8 - Employment Verfication Letter from CPA received via FedEx!!! That was SUPER FAST! By Feb. 7 - Financial statement completed. Guardianship statement completed, reference questionnaires and reference letter info sent out to our 3 references, photos taken of outside/inside home, proof of health insurance completed! Sent e-mail to CPA requesting Billy's employment verification letter. Made copy of 2006 1040 tax form, home ownership proof copied, statement of faith signed, formal application (for homestudy) completed, other homestudy docs signed. Environmental Health Inspection passed! Feb. 5 - Doctor appointments went well. Environmental Health Dept. called (SO FAST!) and set appointment for Thursday the 7th. Hello! Feb. 4 - Dossier packet arrived, fees for Environmental Health Inspection were paid, ordered new marriage certificate, residential history was completed. Reading agreement completed. Home sketch/measurements completed, copies made of birth, marriage certificates along with drivers licenses and social security cards - for homestudy. By Jan. 31 - Home study packet arrived! Autobiographies were re-written. By Jan. 15, 2008 - Birth certificates were ordered and received, passports needed no updating, and doctor appointments were made for physicals. Dec. 28, 2007 - Decided to adopt from Ethiopia. Began gathering info for AWAA application. Bayly Family - next in line for twins! Blackwell Family - Referral for Girl! Bowman Family - Referral for a girl! Britton Family - Referral for boy! Caldwell Family - Referral for boy! Chan Family - referral of 2 month old baby boy! Forrest Family - Referral for Girl!!!!!! Hall Family - Referral for boy! Hammond Family - Referral for baby boy! Hutchinson Family - Referral for 2 sibling girls! Jones Family - Girl Referral! Kerby Family - same DTE as us. Also asking for a girl! Portilla Family - same DTE date as US! Also asking for girl! VanWetten Family - home with both ET girls! Wistrom Family - HOME with both boys!